Eritrea’s challenging terrain, with steep mountains and sandy lowlands, makes transportation difficult for children living with disabilities (CLWD). This is especially true for those with mobility difficulties, as the terrain hinders their to access school. In addition, some communities hide their disabled children, especially if the disability has been with the child since birth, aggravating the multidimensional violation of the child’s rights to education, health, entertainment and social life. There are about 23,000 CLWD in Eritrea, with only 15 percent having access to school. These children suffer multiple deprivations, including stigmatization and limited or no access to social services. The problem is more serious for those living in rural areas. Article 23 of the Convention on the Rights of Child (CRC) urges states parties to support mentally or physically disabled children to enjoy a full and decent life and to support the child’s active participation in the community. 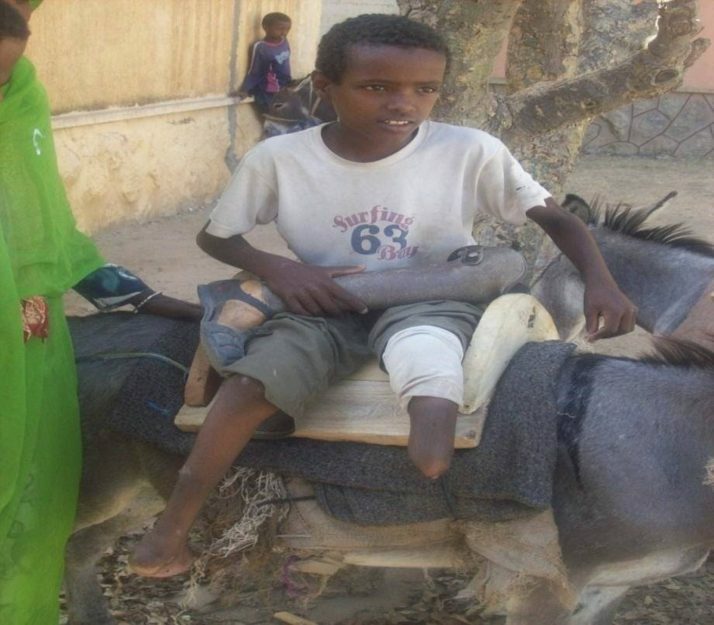 As signatory of the CRC and to address the multifaceted deprivations of CLWD while fulfilling state obligations, Eritrea’s Ministry of Labour and Human Welfare (MoLHW) initiated the Donkeys for School program, supported by UNICEF. Donkeys for School is a multisectoral initiative — involving the health, education, and social welfare sectors, along with communities — that helps CLWD to access school using donkeys as a means of transportation, with additional economic support for the child’s family. For the program to work, the child’s family must agree to send their child to school. The child must also be willing. If this agreement is breached the donkey can be taken away and provided to others in need. The initiative comprises a package of interventions, including the donkey itself, along with its accessories. Other components include community mobilization to reduce stigma against CLWD, counseling for CLWD and their families in order to prepare children for school, and teacher training on inclusive education. The initiative also creates opportunities for CLWD to play with their peers and to become socialized into the community. Children are also able to relieve stress and develop a sense of self-actualization. The intervention’s impact also goes beyond the children themselves, helping to to improve the knowledge of community based rehabilitation volunteers about children’s basic rights and specifically the rights of children living with disabilities. Between July 2009 and late 2014, more than 1,200 CLWDs received a donkey and accessories. There is a plan to reach more children, provided that funding is mobilized. 84 percent of participating CLWD had full class attendance in the two weeks prior to the survey, compared with absenteeism of one or two school days per week prior to the intervention. Travel time was reduced to 35 minutes from 65 minutes, increasing efficiency in time management. There was a 3 percent increase in average grades of sampled beneficiary children. 5 percent of the children supported by the initiative were attending school at the time of the survey. In addition, the initiative has reduced the domestic burden on families of fetching firewood and water, as well as alleviating other household chores. This is of particular benefit to mothers and children, who are most likely to carry out household tasks. Community based rehabilitation volunteers and social workers are instrumental in the whole process, starting with identification of the child (especially challenging if he or she is hidden by his or her family) to providing counseling to families and children to procuring donkeys and following up with children. The donkey is the best means of transportation for the terrain of Eritrea’s rural areas, because alternative means such as wheelchairs, tricycles and motorized vehicles are not only unsuitable for the topography but also economically unviable as running and maintenance costs would be unaffordable. Samuel Isaac is a 2016 G. Barrie Landry Fellow at the Harvard FXB Center, where he is pursuing a certificate in child protection through the Harvard-UNICEF Child Protection Certificate Program. Survey of the Ministry of Labour and Human Welfare of the State of Eritrea.